Magazines that come with freebies are one of life’s simple pleasures! Who doesn’t love snapping up a mini luxe beauty treat, as WELL as getting to read your fave mag?! So I stocked up at the airport before our trip to Turkey, and here are my favourite freebies. 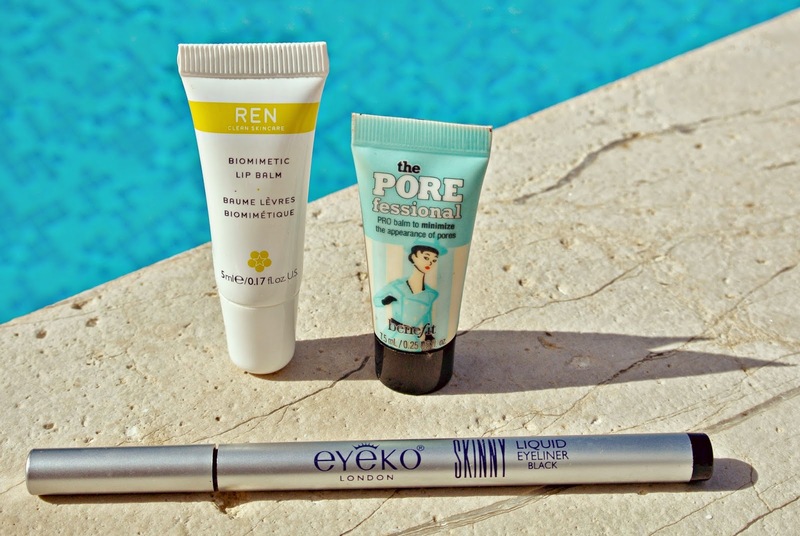 Firstly, the Ren Biomimetic Lip Balm (Red), the infamous Benefit Pore fessional (Elle), and the new Eyeko Skinny Liquid liner in black (Glamour). The great thing about the Ren Lip balm is that you don’t have to poke your finger in a jar to get the balm out, I absolutely hate doing this, especially when my nails get a little longer, and now actively avoid getting balms that come in little jars – Carmex, I’m looking at you! It’s the ideal size to sling in your beach bag to rescue sun-dried lips. I purchased a full-size Benefit Pore-fessional a little while ago, so i’m not sure why I purchased Elle purely to get this mini, but as I said i’m an absolute sucker for freebies so, into the basket it went! I used this every evening while away, it provides an ideal base for a lighter foundation such as a BB, preventing the dreaded shine bought on by hot humid climates. Finally the Eyeko liquid liner which came free with last month’s Glamour magazine. I’d heard mixed reviews about the liner so was intrigued to try it out for myself. Although I only wore the liner for a few hours each evening, I was impressed with it’s staying power – remaining bold, black and fade-free despite the humidity and heat. The skinny tip pen makes the liner super easy to apply, and now that I’m back from holiday, the pen has been welcomed to my daily routine! There are even more fab freebies out with July 2014 magazines, such as a New <ID mascara or lip tint with Cosmopolitan, and a Clinique mascara, chubby lip stick or moisturiser with Glamour. What are your favourite freebies?